Scene@ "What Moves You? Body Language"
Most people wouldn't take directions from a boy wearing neon-checkered Hammer pants, a clown nose and rainbow knee-highs, or think that he could teach you anything about the forces of physics. But I'm not most people. Jacob Tischler, a performer for Circus Smirkus, was demonstrating the physics of clowning, juggling and circus performance as a part of "What Moves You? 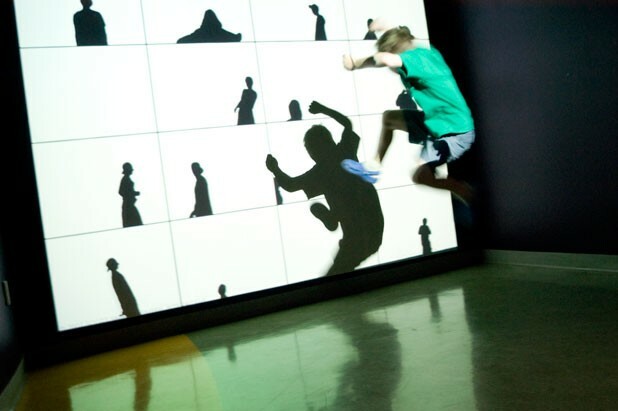 Body Language" - the new exhibit at ECHO that explores the physics of human movement. Before I could say "centrifugal force," I was standing in front of an audience of toddlers and parents, volunteering for a trick Tischler called "the human table." Four chairs were arranged in a tight square, with the seated volunteers facing in all four directions. "Now, lean back on the person's knees behind you and push up with your hips to support the person leaning on your knees," Tischler said. OK, I thought, this won't be too bad. "Now keep balancing, and I'm going to slide the chairs out from under you," he said in the same calm voice that doctors use before sticking you with a hypodermic. That's when it occurred to me the other volunteers supporting my weight and saving me from a bruised tailbone were complete strangers. But there was no turning back. When the last chair was removed, some magical force called the center of gravity kept our human table standing. I'll admit it was pretty cool, but it was also nice to return my center of gravity to the upright position. As I explored the rest of the exhibit, transferring my weight step by step, I saw children and some creative adults recording the movements of their shadows on Snibbe Screens. These look like homemade versions of those iTunes TV commercials, and you can email the images to family and friends. I even witnessed rotational motion take its toll on one boy, who fell off a spinning turntable. After that spill, I wondered, would he ever take a physics class? I remembered later that I didn't take physics in high school myself. Maybe I would have if the teacher was a clown and we could have made shadow puppets on the dry-erase board.